The Komodo dragons were probably discovered as early as the 2nd century AD. Chinese traders seeking to plunder Komodo's underwater treasure trove of pearls, returned home with tales that are said to have enhanced the mythology of the Chinese dragon . Maps were made with a note saying "Here be dragons", warning people of Komodo's inhospitable nature. These stories were taken lightly as no one seriously believed that dragons existed. The dragons were 'discovered' by Westerners in 1910 when Lieutenant van Steyn van Hensbrock, a Dutchman stationed in Flores, followed up on local stories of a "land crocodile" and a report by a Dutch pearling fleet of a 6-7m long creature. A year later, he finally found and shot a specimen. He sent the skin and photographs to Peter A Ouwens of the Zoological Museum of Bogor, Java. Ouwens was intrigued and collected more specimens. After examining these, Ouwens wrote a paper in 1912 declaring them the largest lizards and suggesting their current name: Varanus komodoensis. In 1915, the Dutch colonial government protected the rare lizards, making it illegal to hunt or capture them without permission. Before this prohibition, up to 600 were killed a year as hunting trophies. However, little attention was paid to the dragons with the outbreak of World War I. Size: Males are 2.1m long, females 1.8m long; weight about 70kg. There are records of a captive male dragon growing to 3.13 meters and weighing 166 kg. Babies: 20-25 eggs are laid, incubation 8-9 months. Maturity in 5 years. Social life: Solitary, although several may gather at a large carcass. Distribution: The Indonesian islands of Komodo, Rinca and Flores, which lie about 450km east of Bali. The Komodo dragons have the smallest range of any of the world's large carnivores. Classification: It is a member of the monitor lizard family Varanidae, which today have only one genus Varanus . The residents of the island of Komodo call it the ora , buaya darat (land crocodile), mbou and biawak raksasa (giant monitor). The longest lizards: The Komodo may be the largest but it is not the longest. The longest lizard is a monitor lizard found in New Guinea, the Varanus salvadorii . Known as the Papua monitor, this is the longest lizard, measuring up to 4.75 meters. The bulk of the length, about 70%, is made up of a long, whip like tail which helps the lizard balance in trees. Touch: Komodo Dragons have hard body armor made up of scales. Since the scales make it difficult to feel anything, the Komodo have special spots or sensory plaques. At least one of these plaques, which are connected to sensory nerves, can be found on every scale. Sight: Komodo Dragons can see as far as 985 feet. Because their retinas only have cones, the can see color but have poor vision in dim light. The Komodo have round pupils that are more like the eyes of mammals than reptiles. Hearing: Komodo Dragons hearing range is much smaller then humans. They have trouble hearing low-pitched and high-pitched sounds. Smell: Although the Komodo can smell through the nostrils on the end of the snout, it is not very effective. The Komodo Dragon does not have a diaphragm, the muscle that pushes air in and out of the lungs. This makes it almost impossible to get enough air into the nostrils in order to pick up a scent unless a breeze is blowing directly into them. Taste: Dragons have no taste buds in their mouth or tongue. The only have a few in the back of their throat. Vomero-Nasal: This "sixth sense" is a combination of taste and smell. The Komodo uses a specialized forked tongue to gather chemical information from the air and surrounding objects. The gathered chemicals are rubbed off onto pads on the floor of the mouth. These pads send information to a small organ (Jacobson's organ) that translates the information and sends it to the brain. By analyzing molecules in the air in this way the Komodo Dragon can "smell" objects as far away as 2.5 miles. 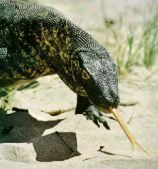 Komodo dragons have 60 small (about 2cm), sharp, backward pointing, laterally compressed and serrated teeth. These are designed to slice, tear and cut very effectively but not to chew. New teeth emerge behind the old, not underneath as in other lizards. This type of dentition is rare in lizards but common in sharks. These teeth are hidden in the fleshy gums, which is why the dragons do not have the 'toothy smile' that crocodilians do. Since the teeth of the Komodo dragons are not designed to chew, lumps of food are torn off, thrown to the back of the mouth, and swallowed whole. Although the Komodo dragon doesn't breath fire, it's mouth contains death. The saliva of the dragon contains at least 4 types of toxic bacteria. The dragon's tooth serrations harbor bits of meat from the dragon's last meal. Komodo dragons also frequently bite through their own gums as they eat. The saliva and blood combination and the protein-rich residue in the teeth provide an ideal culture for the bacteria. These make the dragon's breath quite foul! A Komodo's bite causes profuse bleeding and are slow to heal. Although a dragon is not always successful in immediately bringing down a large animal, the bitten animal usually dies soon after, usually within a week. Infected by the bacteria, its wounds become infected and turn septic (septicemia). The Komodo dragon tracks the weakened animal, harassing it until the animal finally dies. However, if a Komodo is bitten by another Komodo, it doesn't suffer any ill effects. The anti-coagulating properties of the Komodo's saliva, and natural immunity to each other's saliva is being investigated for human medical applications. 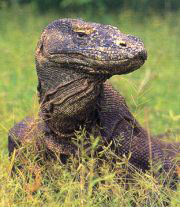 Komodo dragons can run at 14-18 km/hr over short distances, using their short, powerful legs armed with sharp claws. But they cannot chase down swift-footed prey like deer. What did you think about the Komodo Dragon?